Before beginning this response, the author wants to note that he does not aim to represent the LGBT community but rather aims to provide a response to many of the topics raised by Will Neff and the commentators who posed additional questions and concerns about the LGBT community within ultimate. We are here. We are the youth who show up to their first ultimate pickup scared and confused how to play. We are the women who have no problem playing a female down because of ratio requirements. We are the men who are role models to the community, providing everyone with that ultimate experience that we all hear about so much. We are also Gay, Lesbian, Bisexual, and Transgender (LGBT) athletes who love ultimate. Will Neff recently wrote an article posing the question about where all the gay men are within the ultimate community and exploring how to best promote diversity and inclusion through our everyday interactions. He shared his experiences of interacting with other individuals, some of which he learned were gay and others who he felt did not provide the appropriate environment for LGBT athletes. He laid out pointers on how to better our inclusivity through changing our dialogue and understanding how certain privileges can be used to help rather than hinder progress. The purpose of this response is not to criticize his question but to inform him and others of some of the LGBT individuals, groups, and tournaments that already exist. After reading through the comments section of his article, it should be clear that LGBT ultimate athletes exist. While this should come as no surprise, what is amazing and nice to hear is how spread out we all are. Just as ultimate is in almost every city so is an LGBT individual who may want to play this awesome sport. 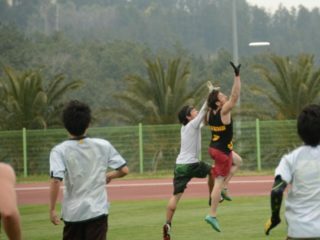 A simple Google search for “LGBT ultimate League” or “LGBT Frisbee League” brings up multiple listings of leagues in California, Chicago, and D.C as well as reddit links about ultimate players struggling with this very issue. When looking through OutSports, the premier leader in showcasing LGBT athletes coming out in their own sports, there are very few stories of ultimate athletes experiences but those who have shared their struggles have helped lead the way for future individuals. When I came out in 2011, I felt that there were no other ultimate athletes who shared my story as an LGBT student athlete. While pursuing my undergrad degree at a conservative town in California, I posted my story online in 2013 for others to read and to hopefully give hope to those who felt they were all alone. While I initially spoke through frustration and anger at being alone, I quickly learned to embrace my sexuality and work for change and inclusivity. It was not too long afterwards that Elliot Trotter came out via the Seattle Rainmakers and had his story published to OutSports. While he did not intend to become a role model for others, his MLU profile noted that “having that rallying point would inspire others to believe in themselves and serve as a reminder that achievement knows no sexual orientation” . This reminder that achievement knows no sexual orientation is demonstrated through the showcasing of Brian Calle, 10 year organizer of LeiOut, the world’s second largest ultimate tournament. Through the LA ultimate community, he has experienced not hardships but rather the opposite, inclusion and encouragement to participate. While these three excerpts are only microcosms of the bigger picture, they begin to form the idea that we are not alone and not limited by our sexualities. As mentioned earlier, there are already LGBT ultimate leagues situated around the US and Canada. 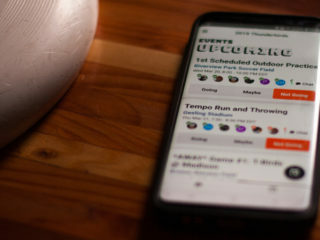 It has been the work of Big Gay Frisbee (BGF) Ultimate to reach out to these groups and make connections to them to help provide a communications net for LGBT athletes. Through the outreach, this Los Angeles based organization has also located other pockets of LGBT groups such as BGF San Francisco, the D.C. group of UltimateOut, and the Chicago Metropolitan Sports Association. Canada has even had some groups in the past based out of Edmonton and Toronto. These groups showcase that just like the regular ultimate community, there is a subset of LGBT ultimate players who have already created their own teams and leagues. LGBT themed tournaments do exist, and this is an open invitation to all looking for fun competitions. Over Martin Luther King Jr. weekend, there is the annual Sin City Shootout Ultimate Tournament held in Las Vegas, Nevada. While on the same weekend as LeiOut, this tournament is part of a much larger LGBT sports conference, also named Sin City Shootout, bringing in over 8,500 athletes competing in 24 different sports. While this tournament is not nearly as competitive as LeiOut, the fun factor is more important here, even going so far as including a pajama pickup on Sunday for those too hungover to continue playing. For the Los Angeles Pride in June, BGF hosts a one day round robin tournament where all those visiting are invited to play a little ultimate and meet other athletes and allies. 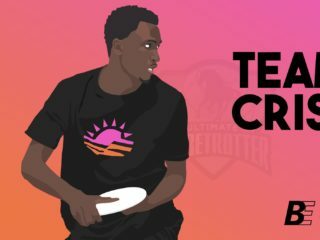 While the tournament is only two years old, BGF is working to expand their outreach by working with Los Angeles Organization of Ultimate Teams (LAOUT). In years past, BGF Ultimate went so far as to march in the LA Pride Parade, one of the first and few ultimate groups to walk in a Pride parade. Now it is arguable that with these groups being situated in large metropolitan areas, many ultimate athletes from smaller parts of the United States and beyond may not know or ever have the opportunity to interact with them. So what can be done on an individual and community level? An athlete running around an ultimate field in a pink tutu brings more diversity to a competition than any athlete ever actually realizes. It shows even the most scared or insecure athletes that it is ok to be who you are and know that this sport supports you. The Contested Strip’s “Taste the Rainbow” is a great example of how allies play a role in the LGBT community, illustrating the varying degrees of sexualities and genders that participate within the sport. Team names such as Floppy Discs and Netflicks and Chill, as well as team uniforms such as unicorn onesies or short shorts for beach ultimate, change the idea of masculinity and challenge even the most macho guy to break his comfort zone. Sometimes, just being an ally on the fields is as important as finding other LGBT individuals because it shows everyone that acceptance and inclusion are a part of the game. LAOUT is a great example of this by awarding a lesbian couple the 2015 New Cute Couple of the Year. While politics does not often interact with the ultimate community, nondiscrimination clauses do wonders for assuring that the LGBT community are welcomed. With MLU and AUDL rising in popularity and USAU having been around for quite some time, many of their athletes are being paid to play, thus essentially making them employees of the sport. With over half of the United States lacking nondiscrimination laws protecting the LGBT community from being fired just for being gay, showing support and encouraging participation is more important than ever. At the time of this writing, the USAU, Austin Sol, and MLU have been the only ultimate organizations to speak out against the North Carolina HB2 bill for its discriminatory language. For those playing at the collegiate level, check with your university to see what anti-discrimination clauses are in place as well as what policies they have in regards to inter-team dating. Additionally, while some universities may have safe zones for their students, some may not be properly promoted for all to see. So when Neff noted his thoughts on gays not being accepted, it can be understood that in various parts of the US, some athletes may not feel comfortable nor safe coming out. Neff’s article brought up the need for changing our language and checking our privilege so that we can work towards inclusion for all. For those looking to take steps further, look to the You Can Play Project for guidance on how to promote inclusivity in athletic environments. Working with the AUDL/MLU to promote Pride nights shows their dedication to inclusivity and diversity. As an example, in recent years, Major League Baseball has incorporated Pride Nights into their season schedules. Lastly, starting this conversation with our youth helps to develop future ultimate athletes into inclusive allies. Will Neff deserves thanks for raising the topic of LGBT athletes to the Skyd community. While it is understood that ultimate could make better strides to promote diversity, it is important to remember how inclusive the community already is. Disregarding the progress that has been made could make it appear as if no headway has occurred at all. This could not be further from the truth. Showcasing our support, either through our conversations with each other or through our workings with organizations, is critical for the inclusion of all who want to play this wonderful sport we call ultimate. Charles “Woodstock” Naurath is a graduate student studying Sports Management at California State University, Northridge. He’s set up multiple tournaments within the ultimate community, including the BGF Las Vegas Tournament, LA Pride Invite, and the 2013 USAU Collegiate Southwest Regionals Tournament. He’s worked within the LGBT and ultimate communities to promote diversity and inclusion. He can be reached at Charles.Naurath@gmail.com. If you are interested in being added to the BGF contact list to connect with other LGBT ultimate groups and/or athletes, please email biggayfrisbee@gmail.com. BGF’s outreach is growing but it can only get better through communication with Ultimate athletes like yourselves.